Is horseback riding easier than walking? How old do children have to be to take a horseback ride? How much are trail rides? How should I decide which trail ride to take? Should I tip my wrangler? What time should I arrive for my trail ride? Can I wear a backpack? Who will guide us on the trail? Are we in danger of bear attacks? Do I need to bring bear spray on the ride? Can I bring a firearm with me on the ride? Do I have anything to be scared of? It is a common misconception that horseback riding is easier than walking. Horseback riding uses a tremendous number of muscles, many of which you may not be accustomed to using on a regular basis, so in some ways it can actually be more strenuous than walking. Given that horseback riding uses many muscles in ways that you may not be used to using them, it is likely that you will be sore. It is a good idea to stretch before and after your ride and to drink plenty of water to help relieve sore muscles. Children 7 years and older can ride at our Apgar and West Glacier Corrals and on the one hour and two hour rides at our Lake McDonald Corral. Children 8 years and older can ride at our Many Glacier Corral. Children 10 years and older can do the ride to Sperry Chalet. Our weight limit is 250 pounds for the majority of the season and then drops to 200 pounds after September 10th when many of our horses start to go home for the fall/winter. Additionally, the Trout Lake All Day Ride has a 200 pound weight limit all season. We strictly enforce our weight limit and have scales at each corral location for any guests that may be close to the weight limit. Our trail rides range from $40 to $175, depending on the duration of the ride. Ride durations range from one hour to an all day trip (6 to 8 hours). We tend to recommend the two hour ride for families with young kids as well as guests who have never ridden before or who don’t ride very often. Half day rides and all day rides are better suited for experienced horseback riders or athletic guests. If you are eager to get lots of horseback riding in during your vacation, a popular option is to take a two hour ride at each of our corrals. This way, you get to see lots of the Park (each of the corrals is located in a unique part of the Park) without running the risk of making yourself sore from spending too much time in on a single ride. At Swan Mountain Outfitters we say, “If you liked your ride, kiss your horse and tip your guide!” Many people do not realize that it is customary to tip your trail ride wrangler. If you had a great time on your ride, show your appreciation by tipping your wrangler. The standard is 15-20% – similar to what you would tip a waiter or waitress. Reservations can be made via phone from 8:00am to 6:00pm mountain standard time. Please call our main reservation number for any advanced reservation. For same day reservations during the summer, please call the corral you wish to take a trail ride out of directly. For a list of phone numbers and the information we will need to know to reserve your trail ride, click here. Also, due to increased visitation to Glacier National Park during the summer months, occasionally the National Park Service has to manage entry into the Park via a “one car in, one car out” policy. If this happens, it is critical that you have a copy of your confirmation so that you can prove your need to enter the Park. Please print or download a copy of your confirmation and bring that with you. Note there is little to no cell phone reception in the Park, so you will need to be able to access the confirmation offline. Our policy is to collect full payment for any advanced reservation. We can charge your reservation to a Visa, MasterCard or Discover. A full refund will be granted with at least 8 days notice of cancellation. Between 24 hours and 7 days notice of cancellation a 3% cancellation fee will be applied. Within 24 hours of the ride, the trip becomes non-refundable. Arrive no later than the times stated on this website to check in for your ride. 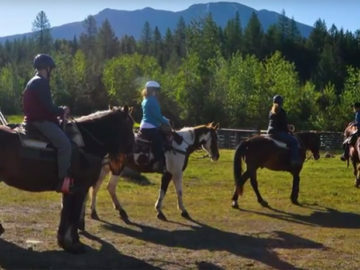 Our check in process consists of a proper trail ride orientation (covering such topics as approaching the horses, getting on and off, sitting in the saddle, proper use of the reins and stirrups, etc. ), matching each guest up to the appropriate horse, mounting all the horses and checking all the equipment. In terms of planning other activities around your trail ride, total time with us will be about an hour longer than the duration of your ride. For example, guests on the one hour ride will be with us for about two hours, guests on the two hour ride will be with us for about three hours, etc. Weather in the mountains can change in the blink of an eye, so it is a good idea to dress in layers (i.e. tank top or t-shirt, long sleeved shirt and a sweatshirt or light jacket). Closed-toe shoes and pants are required. Your own hat (or one of our helmets), sunscreen and a water bottle are also recommended. Backpacks, fanny packs or any kind of strap around the neck are prohibited on our rides. However, minimal gear can be carried in pommel bags for short duration rides or saddle bags for longer duration rides. Pommel bags have two pockets that each measure 4 inches wide by 6 inches tall by 3 inches deep. They sit over the horn of the saddle and are perfect for a water bottle, keys and a wallet. Saddle bags have two pockets that each measure 12 inches wide by 12 inches tall by 4 inches deep. They are attached to the back of the saddle and are perfect for a lunch, a first aid kit or toiletry bag, an extra water bottle or a camera. Extra jackets can be tied to the back of the saddle. No. Though some of our trail rides are more difficult than others, we have plenty of trails that are great for beginners. Our experienced wranglers will guide first time riders through every step of the process to make sure they feel comfortable and safe. We employ several experienced trail ride wranglers. Not only are these individuals horse experts, but they are all around great people dedicated to making your experience in Glacier National Park one to remember. If your wrangler has done a great job on your ride, feel free to show your appreciation by tipping them as you would a waitress or other customer server. Glacier National Park spans over a million acres, making it virtually impossible to list all the amazing things you might come across. In a nutshell though, you can expect to see shady forests, stellar snow-capped mountains, glacier-carved valleys, majestic alpine vistas, aquamarine streams and lakes, wildflowers, and all sorts of wildlife from coyotes to bear to deer. Picture taking is not allowed while actively riding and short duration rides (one and two hour rides) do not stop, so cameras are not allowed on short duration rides. Cameras can be brought along and packed in saddle bags for longer duration rides (half day, full day and overnight trips) for use when you dismount. This policy is for your safety and is based on the same concept as no texting while driving! We can provide lunches on rides out of our West Glacier Corral, however Swan Mountain Outfitters – Glacier Division is not permitted by the National Park Service to serve meals. As a result, we encourage our guests to bring their own food and water for rides out of Apgar, Lake McDonald and Many Glacier. We can also make up a delicious Discovery Center boxed lunch for you at our main office in West Glacier. The lunch consists of a hearty bagel sandwich with MT made meats and cheeses, a gluten free Made in MT Kracklin Kamut crunchy snack, Made in MT granola from Gluten Free Prairie, an apple, a bottle of water and a Montana Made carmel. 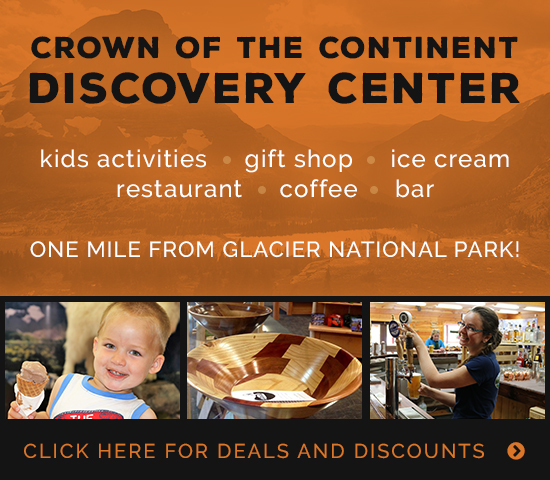 You can take the lunch along on your trail ride or any of your other exciting Glacier adventures. Since bears are wild animals, there is always a chance of encountering them on the trail. However, the horses make a lot of noise, and bears in the vicinity tend to wander off to avoid contact. All of our wranglers have completed Bear Safety Training and their foremost job is to protect our guests. No. In fact, bear spray is prohibited on our horseback rides. The chances that the bear spray will inadvertently affect the horses instead of the bear are extremely high. If that were to happen, you would be in much greater danger of a horse accident than you would have been of a bear attack. The horses are actually your best defense against bears that you may see out on the trail. As of February 22, 2010, a new federal law allows people who can legally possess firearms under applicable federal, state, and local laws, to legally possess firearms in this park. However, it is Swan Mountain Outfitters policy that no guests or employees may carry firearms with them on our horseback rides. While it is not mandatory for adults eighteen and over to wear helmets, we highly recommend that you do because many horse related falls result in head injuries, regardless of the experience of the rider. If you elect not to wear a helmet, we will ask that you sign a helmet waiver. No. Horses may be big animals, but they are very gentle and actually more scared of us than we are of them. Also, your wrangler is a horse expert who knows Glacier National Park very well.